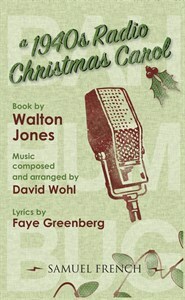 Off Book Theater Company @ Mt Washington UMC is pleased to announce open auditions for 1940’s Radio Christmas Carol. Speaking and non- speaking roles and singing and non sing roles are available. Performance dates are December 8, 9 and 10. The long-awaited sequel to the popular The 1940’s Radio Hour. It’s Christmas Eve, 1943, and the Feddington Players are now broadcasting from a hole-in-the-wall studio in Newark, NJ, and set to present their contemporary “take” on Dickens’s A Christmas Carol. Whether it’s the noisy plumbing, missed cues, electrical blackouts, or the over-the-top theatrics of veteran actor, but radio novice, William St. Claire, this radio show is an entertaining excursion into the mayhem and madness of a live radio show. St. Claire’s escalating foibles and acting missteps propel the show to a simultaneously comedic and heart-wrenching dramatic climax: St. Claire has an on-air breakdown, and begins to connect his own life with that of the classic Dickens tale. In order to “save the show,” the company improvises an ending to Charles Dickens’ classic as a film noir mystery, featuring a hardboiled detective, a femme fatale, and an absurd rescue of Tiny Tim (and the Lindbergh baby) from the clutches of a Hitler-esque villain named Rudolf!